I've got a bunch of domains to manage, and it's not exactly the easiest of the tasks. Each domain comes with lots of information (Registrar, expiration date, WHOIS record) and it's very easy to get lost in all these usernames and passwords. Plus, if you consider that you've purchased a domain because you probably want to run a website on it - then add database data, hosting, content management system, users. 1Password isn't meant for managing domains, especially multiple domains at once. If you, like me, wanted to buy goodfuckingdesignadvice.com but went for other 5 similar domains instead, then DomainBrain 2.0 is for you. 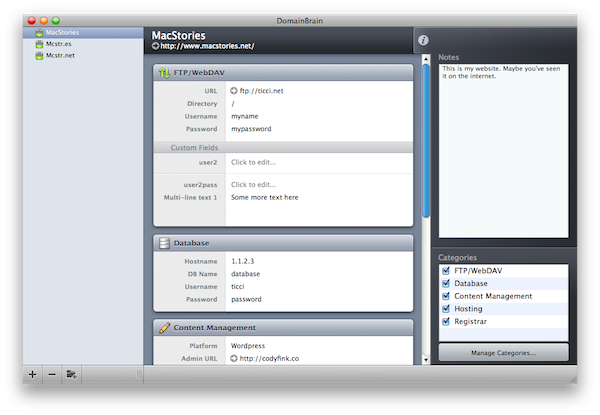 It's the best tool to manage a "domain library" you could ever find on OS X.
DomainBrain has been around for a while, actually, but the 1.0 version never really managed to impress me and convince me to keep it on my hard drive. Developed as a side project by Anthony Piraino's One Button Mouse (Piraino also works at that magical place called "The Iconfactory"), DomainBrain 2.0 is a complete rewrite and re-imagination of the original app, now really geared towards users who need to save domain info, usernames, passwords, database hostnames and CMS data. 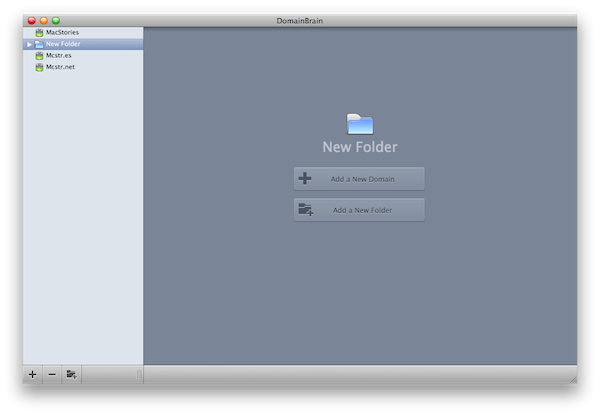 All in a single window, with the possibility to create folders. I might just risk it and call DomainBrain 2.0 "an iTunes for domains". Whether you're a webmaster or web designer, you need to keep track of domain info. DomainBrain 2.0 sports a completely overhauled UI with many improvements over the first versions, and many new features that will, indeed, help you in keeping track of all your domain's data. The most important new feature is the ability to manage categories, create new ones from scratch and create custom fields to put into these categories. When you add a new domain in DomainBrain 2.0, you're prompted by default to fill the info for FTP/WebDAV, Database, CMS, Hosting and Registrar. You can enter additional notes in a right-side notes panel, which looks beautiful. The whole app looks polished and elegant, Piraino is a real artist. You can show/hide categories, but if you hit the "Manage Categories" button you'll be able to create entirely new ones and put custom fields (such as email, or "user 2" or "designer" for multi-user websites) inside them. For people who need to keep track of multiple users in their websites, this is just perfect. Your domains will be accessible through a sidebar on the left, where you can also create folders to better organize them. A pretty handy feature. What's even better about DomainBrain is that is free for use if you have three domains or fewer. If you need more, you can purchase a license at $29.95 - money well spent. DomainBrain is a beautiful application, the best for managing multiple domains and storing important information in a single interface.